Roland JX-8P is a nice synth from the 80′s. It represents well the sound of that decade, although I think it’s still the better side of it. The JX-8P is an analog synth, but the osillators are digitally controlled (DCO) for more stable operation. The name can be misleading if you think it refers to the polyphony as the synth really has only six voices with two oscs per voice. Roland’s last analog synth was the bigger brother JX-10 (Super JX) which doubles the synthesis power of the JX-8P and has 12 voices of polyphony. 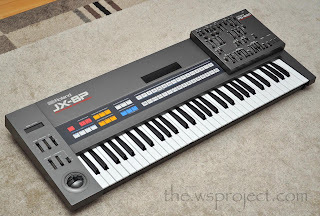 There was also the JX-3P from a year earlier, and it seems to be Roland’s first MIDI capable synth along with the Jupiter 6. In the 80′s digital was coming big time and that naturally affected synths as well, not always in a good way. One downside of this new digital technology was that the synths' programming interfaces were cut down significantly. The old analog synths had a dedicated knob, switch or slider etc. for just about every parameter in the synth, but a typical digital interface was a couple of buttons that called up one parameter at a time for adjusting it, and the whole instrument was operated from a tiny LCD display. This might have been cost saving, but programming a synth like that became tedious and uninspiring. A positive feature of digitality was the possibility to store sounds. The JX-8P suffers also this very boring digital user interface. But fortunately Roland made a separate programmer unit for it, the PG-800! The programmer is quite an essential if you really wish to dive into the synthesis of JX-8P (or JX-10). The sound of JX-series is a bit different from the popular Juno-series. But the JX-8P offers a lot more programmability of sounds with it’s dual oscillators. 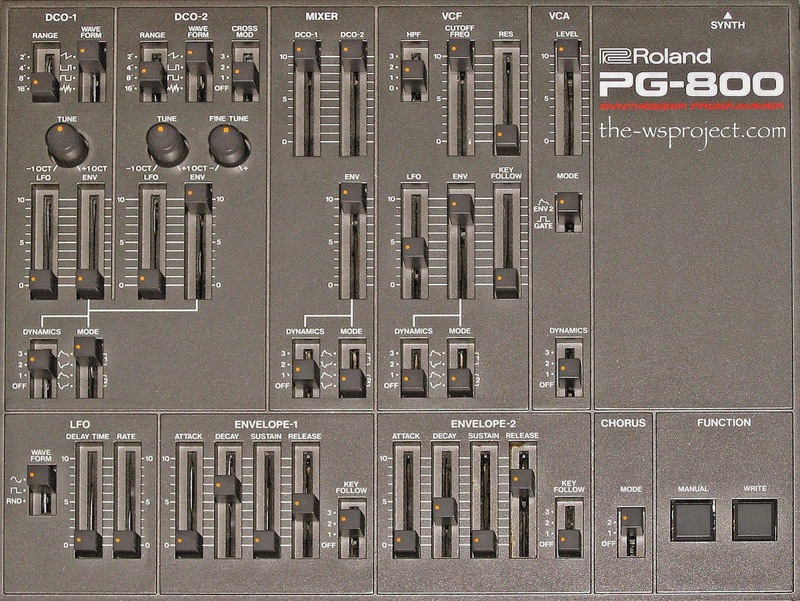 Roland was advertising it being able to deliver "rich-timbred patches usually associated only with digital synthesis" along with classic analog sounds. And that’s kind of true with functions like waveform cross-modulation and oscillator sync for example. But the synth is really excellent with classic analog sounds like string pads and brass sounds. The JX-8P has also a very fat and warm-sounding stereo chorus. 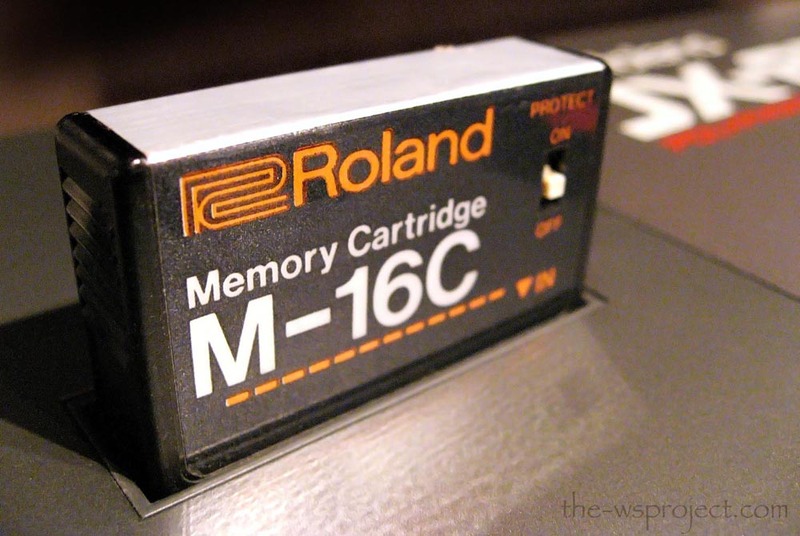 Memory cartridge to store more sounds. I find the overall sound quite dense and it certainly can be very thick but not aggressive at all. And how about a unison-mode which can be detuned? You got it here. The bottom end is pretty boomy and many times some low frequencies have to be rolled off with the highpass filter. 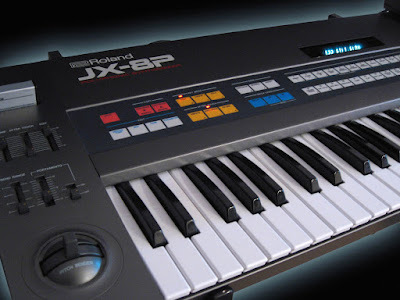 The JX-8P is also very dynamic instrument and reacts very well to keyboard velocity. The keyboard itself is pretty good too, but the aftertouch doesn’t work on mine, and that seems to be a typical problem with these. The JX-8P is a very nice and smooth analog polysynth although a bit ugly in my opinion, (the JX-3P looks better). 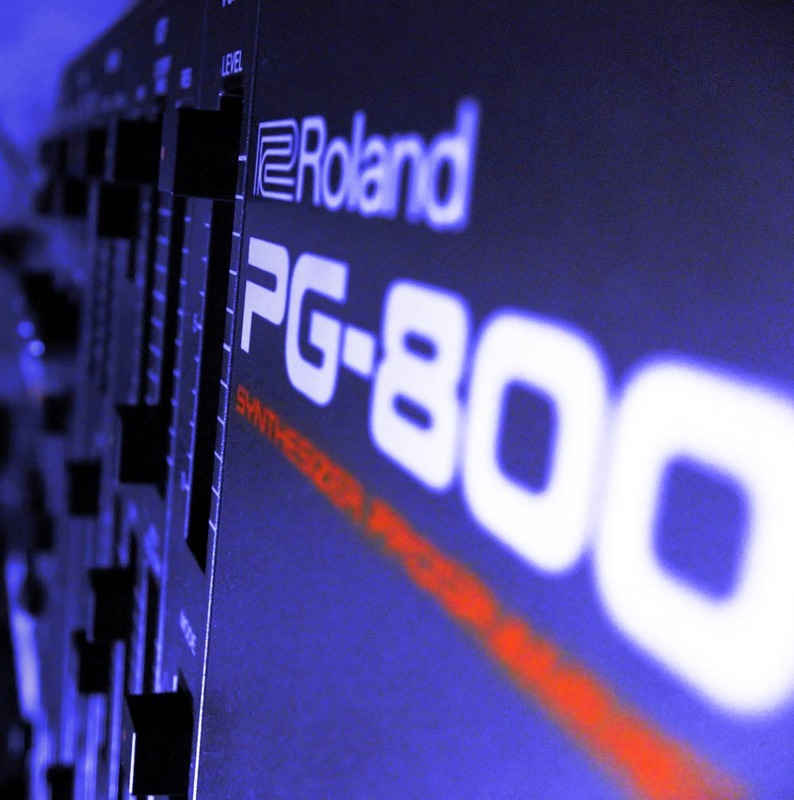 It can be had pretty cheap but the PG-800 programmer is usually raising the value considerably. Soon after I realized how wonderful my first analog synth, the Yamaha SK-20 sounded, I wanted to get more involved with analog synths. 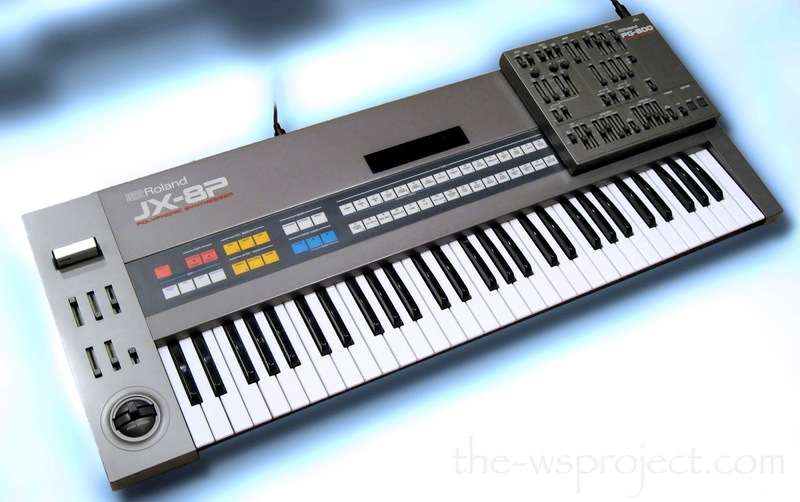 My next purchase was this JX-8P. It sounded excellent but very different from the SK-20. I used it a lot on the albums Enlightenment, Subtle Moves and Orion. 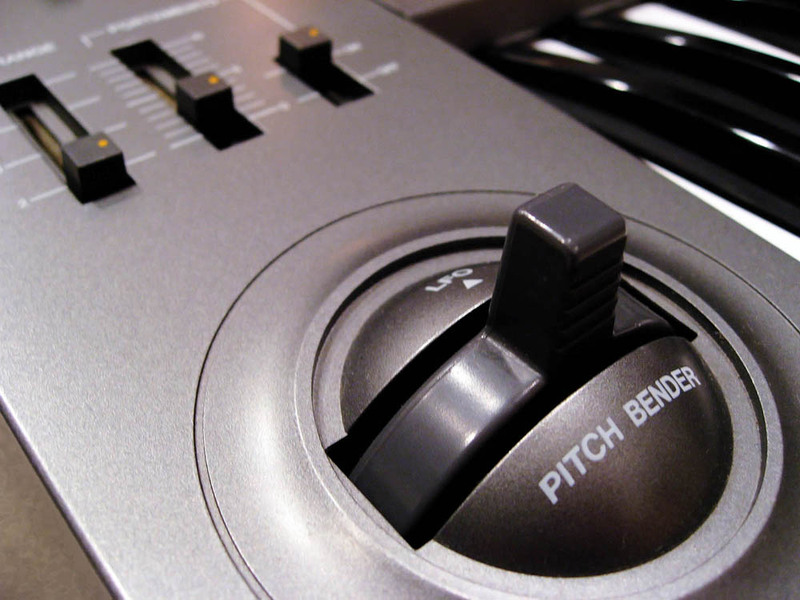 Now you can control the synth! 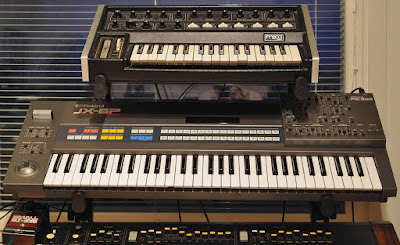 Roland JX-8P under a Micromoog.